Two functions, f and g, are graphed in left panel. Parametric curve, C(t) = ( f(t) , g(t) ), is graphed in right panel. Parameter interval, L <= t <= R, is specified by emphasized (red) segment on x-axis of left panel; change L or R by moving an endpoint of that segment. Corresponding parts of graphs for f and g are also emphasized (thicker blue and green). 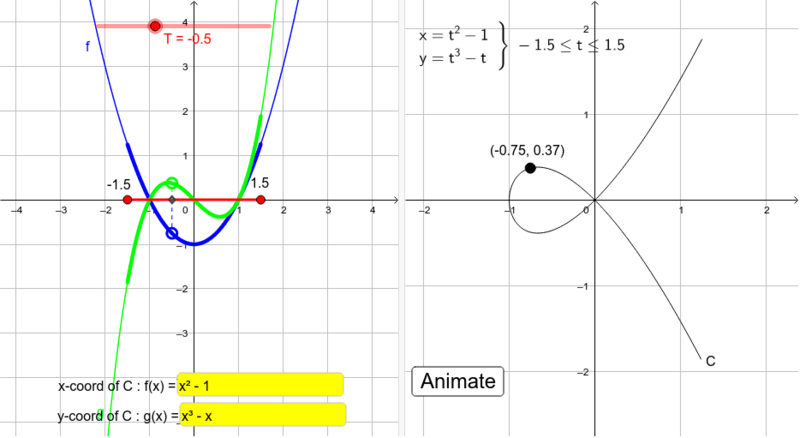 Animation shows point C(T) moving on the parametric curve [in right panel] and corresponding points on graphs of f and g together with parameter value T [in left panel]. The coordinate functions can be changed using input-boxes in left panel [use x as independent variable for those expressions].